Enchanted Plate created in the lower right slot. Book is destroyed when created. 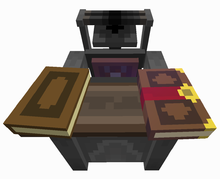 The Enchanted Plate is a item in BiblioCraft that gives the ability to copy enchanted books. It is created in the Typesetting Table and needs a Print Press Chase and experience levels to create. Put the enchanted book you want to turn in to a plate in the lower left slot and put some empty chases in the table. Shift right click on the book and if you have enough experience levels it will create the plate which will appear in the lower right slot on the table. Right click to remove it from the table. Hovering over the plate in your inventory will tell you what book it is set to copy. You should use Reading Glasses, Tinted Glasses or a Monocle for this so you can see how many experience levels you need to create the plate, if you don't have the require levels the plate can't be created. To use the plate put it in to a Printing Press by right clicking in the middle of the press, if you have glasses on you will see the name of the book on the plate in the press. Place some empty vanilla books on the left front of the press and apply some ink sacs to the top ink plate. The press will then start working furiously, when it is finished your copied book will appear on the lower right of the press, right click to pick it up. Enchanted plates will take damage with each copy, you will only get two or three copies of a book before it is destroyed. This page was last modified on 15 September 2017, at 19:09.